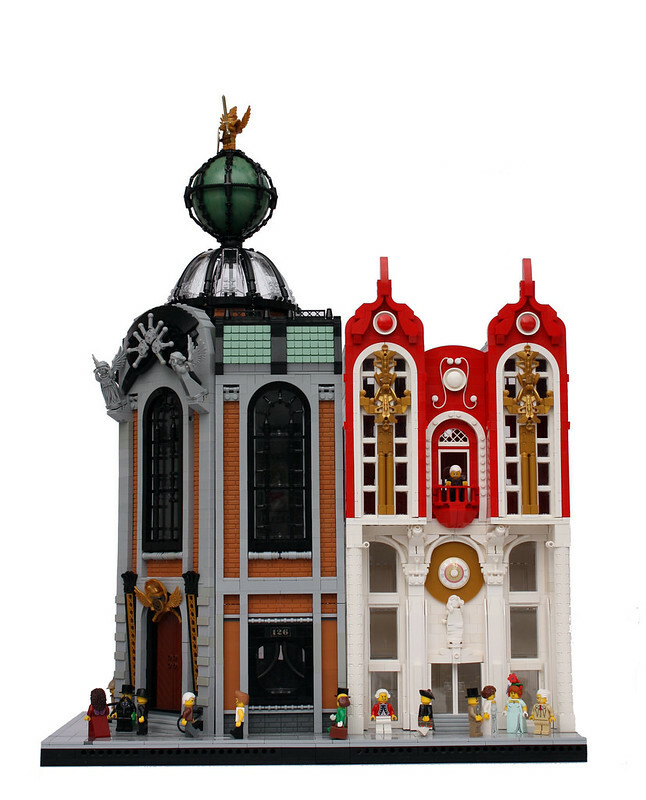 The New Century Corner, a display of five modular houses inspired by early 1900s architecture which I love. This was built for a LUG collaborative modular town in Model Expo 2016 that took place couple of weeks ago. 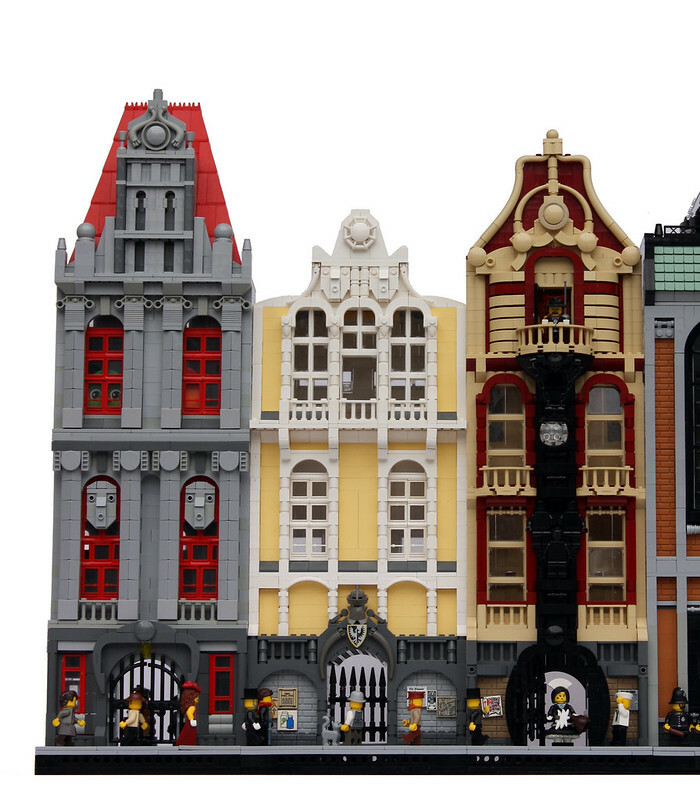 From left to right: House of Two Whistling Geezers, House of Two Sisters, House of the Bat-Lord and Three Sinners, The House of Secret Society of Aviation, The House of Golden Frogs. The houses were built by first tablescrapping some interesting bits and the creating the rest of the building around them. That's what I usually do, anyway. The first of the houses (Two Sisters) was built in last November and the last (Bat-lord and sinners) was finished couple of week before the event. I might expand this to a whole block in the future, with four corner modulars and several houses between them. More pictures and talk on the blog. They are pretty. I think the corner is the most beutifull one tough! Those HUGE windows! That Glass Roof! Really amazing buildings with lots of nice details! I love all of these! Do they have interiors? Amazing - proud, well done and great! Wow these are amazing. Really nice part usages and cool details! Lots of genius ideas of using parts!! WOW! These are probably my favorite MOCs ever. Reminds me of H.P. Lovecraft stories. Very well done, and super inspiring! -The top balcony on the batlord house. -The gated entrance on the two sisters house. -All of the street postered walls etc. You've gotta expand this into a whole city! Horse drawn carriages... a botanical garden... university... definitely have to have an office for that sherlock holmesian detective as well, complete with a private eye sign. I'd be interested to see a seedier darker district as well. By the way, what's going on with the detectives and police down there? Spying on some sort of clandestine meeting in front of the secret society? As I said on Flickr, brilliant modulars and very nice figs - but I'll add here that the red and tan house (awesome architectural details!) and the corner one with that stupendous dome are definitely my favorites! Kudos! Simply spectacular! 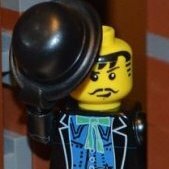 I tip my hat to you, sir! Wow... amazing work! 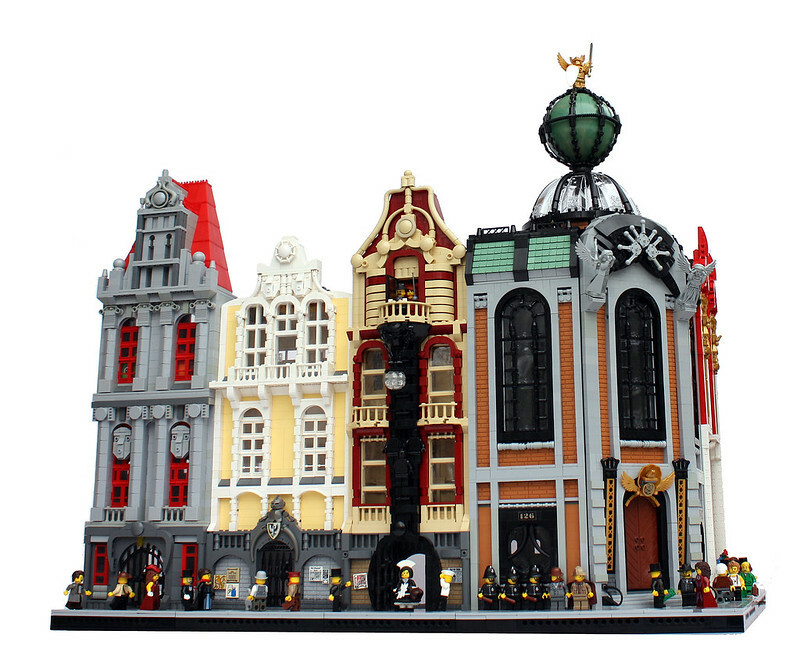 Some of the most original and distinctive modulars I've seen, and they all go together perfectly. Wow. This collection of buildings is fantastic. 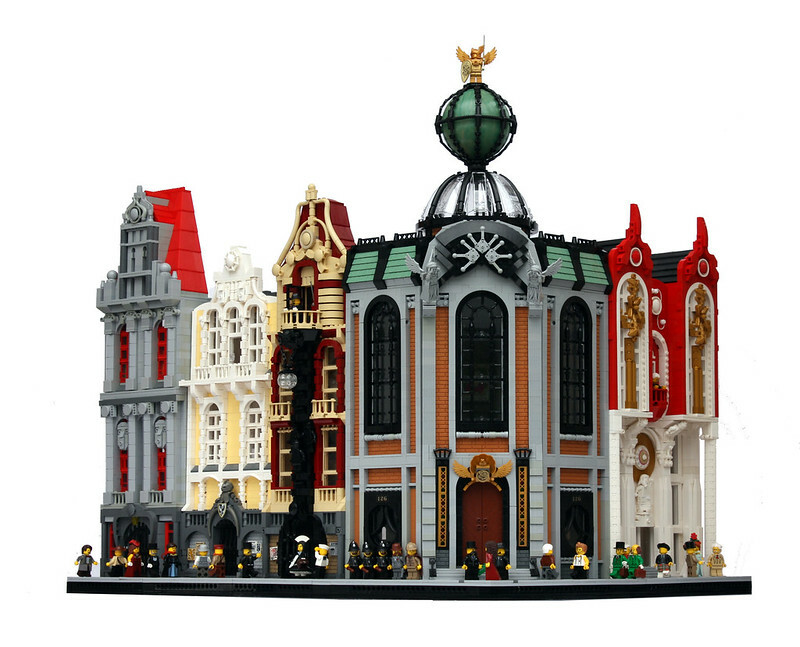 Art nouveau and it's other names is a style I've always loved and wanted to recreate in Lego form but there are no examples where I live to be inspired by. The sphere and domed glass roof on the corner are my favourite elements here but I also appreciate very much the red and white buildings tall columns and windows. Great job! These are simply astonishing. I love them all. Very good thing here. Awesome! Really like the blend of grey, sand green, and dark flesh on the corner building. Added it to my fave on Flickr. Brilliant job! Really nice use of the star wars planet. The sand green and nougat work really well together as well. LOVE modulars so much. These look fantastic. I love the red white and gold combo of 1 of the modulars. The corner building is amazing with those impressive huge windows! The planet on top and the statues are the icing on the cake! Clever usage of the old lego windows! Awesome! Nice use of colours and parts. A great theme and some excellent MOCs. They are all excellently executed. I especially like the glass dome and globe on the top of the Secret Society building. Great Art Deco style, I like them all. That's just amazing, specially the corner, excellent job !!! Each of them has a unique style and wonderful details. Looks like you can build anything and it turns out great.